The Philippines has many beautiful white sand beaches, but also some amazing black sand beaches. And a black sand beach does not mean that the beach is dirty. The sand is black because it has many dark-colored volcanic minerals and rocks. 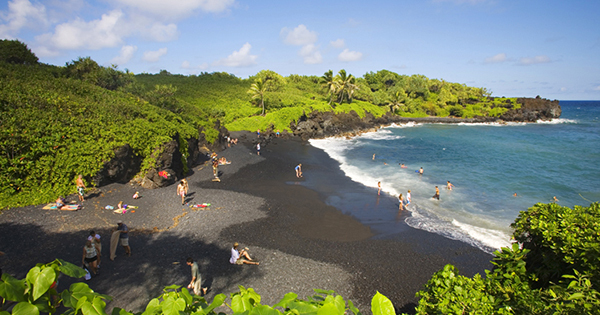 Black sand is said to be derived from cooled lava from volcanoes, and helps to gently exfoliate dull, dry skin. #1 - Santo Domingo, Albay: Because of the volcano presence in Albay, it is known for its many black sand beaches – the most famous of which is in Santo Domingo, Albay. The contrast of the cool, blue water, black sand, and green trees make a very unique but charming sight! No wonder it is being recognized as one of the best in the world! #2 - Bacacay, Albay: Bacacay is a small town on the eastern part of Mayon volcano, and most of its black beaches are located in Barangay Sogod, a mere 5 kilometers or less, travel from the Poblacion. Tourists can find many resorts there if they would like to stay for a day or two, to savor the exotic beauty of Bacacay, amidst black sand – that is a product of millions of years of natural erosion that pulverized the mighty volcanic rocks into fine – textured sands, as described in wowlegazpi.com. #3 - Tiwi, Albay: Situated about 40 kilometers from Legazpi City, Tiwi can be found on the northern area of Mayon volcano. The Joroan shore beaches are the best spots for swimming since the water there is not very rocky. Furthermore, you can get a good view of the Lagonoy gulf and the small islands of Camarines Sur from this point. Come and see the picturesque black beaches in Albay – considered comparable to those in Hawaii! #4 - Dauin, Negros Oriental: Well – loved as a diving site in the Philippines, Dauin boasts of its black beach as well, whose black sand that consists of tiny fragments of basalt, came from majestic Kanla-on volcano – the highest peak in Visayas. Thus, scuba divers both local and foreign, flock to Dauin – truly a paradise for muck diving. Swim with their awesome greater blue ringed octopus, wonderpus, flamboyant cuttlefishes, nudibranchs … and many more! #5 - Puerto Azul Beach, Ternate, Cavite: A well-known venue for international sports, this black sand beach is where you can enjoy several water activities that include cruising, jet skiing and kayaking. Moreover, it has a golf course nearby, where you may play a round of this relaxing game – so be amused just the same.